Nowadays, a large number of "post-80s" have been upgraded to Chao Dao Chao Ma, and they are expected to have an insurance for their own self-consciousness. Why do young children have to buy insurance? The main reasons are: 1. The development of children's functions is imperfect, the virus resistance is weak, and the risk of serious illness is high; 2. Children are naturally active, but self-protection awareness is poor, accidental injuries occur frequently; 3. Education costs are increasing. Become a big expense in the family. Coupled with the deterioration of the environment and the prominent food safety issues, child insurance has become a rigid demand. Children's Day is coming, and it is wise to prepare a health guarantee for the child as a gift. In this issue, we specially selected the children's major illness insurance products of the four major Chinese and foreign insurance companies to compete in order to find a more cost-effective child illness insurance. Mr. Chen, 31, is married for 3 years and his family income is about 180,000 yuan. The wife had just given birth to a daughter, and Mr. Chen, who was a father at the beginning, was happy for himself. to sum up:With a monthly balance of 10,000 yuan, family finances look good. This is just the cost of the young couple. How much does it cost to have a child? And look at the book on the right. Because the child is relatively weak, the body is weak, the resistance is not strong, and the environmental deterioration, food safety problems, daily illness is inevitable, this part of the cost also accounts for a large family expenses, according to media reports, Every year, hundreds of thousands of children in China suffer from serious illnesses, and some families will return to poverty due to illness and become poor due to illness. 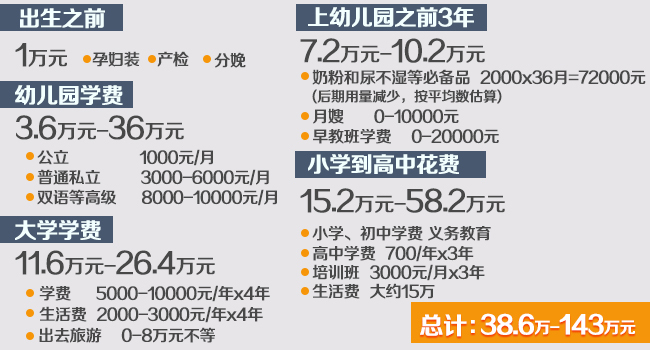 In this way, the cost of raising a baby is far more than the figure of 1 million yuan! It is wise to pay for medical expenses with the financial instrument “insurance”. Mr. Chen is preparing to insure a 0-year-old daughter with a 500,000-strong illness insurance policy and pay for 20 years. He plans to purchase sufficient health protection for his daughter! When paying a heavy illness, it is necessary to deduct the amount of insurance that has been paid for a minor illness. company name AIA Insurance Company Zhonghong Life Insurance Co., Ltd. Tongfang Global Life Insurance Co., Ltd. China Life Insurance (Group) Co., Ltd. The core member of China Sinochem Corporation - Sinochem Group Finance Co., Ltd. Please see the terms in the table below. Major diseases"Three payments"The product divides the major diseases into different groups (for example: Groups A, B, C, D, and E). If the customer is unfortunately suffering from a major disease in one group (assuming Group A), the product is undergoing major disease. After the payment, the remaining two groups (B, C) are still provided with major diseases. By analogy, after the customer receives the second major illness payment, the remaining group of major diseases are still valid. One third of childhood tumors are leukemia, followed by brain tumors, malignant lymphoma, and neuroblastoma. If leukemia is transplanted with bone marrow and the cost of rehabilitation is 500,000, it is recommended to purchase insurance with enhanced this. Quanyou has a lifetime (34 species), Changbao Fuxing (48 species, 8 of which are specific serious illnesses), Kang Jian's life (50 species), and Corning Lifetime (40 species). Kang Jian's life (50 kinds) guarantees the most diseases, and the whole life (34 kinds) guarantees the least disease. Experts pointed out:Serious illness, more attention to product functions, major diseases"Three payments"The function is a high added value for the consumer. When purchasing heavy illness insurance products, pay more attention to the increase.Incidence of severe illnessIt is not necessarily beneficial for policyholders to pay more premiums to increase the type of severe illness that is not high in incidence. If you feel that the premium is high, Xiaobian recommends that you consider it. "Healthy life"
First, protect the adult, then protect the child. Before insuring a child, parents should first buy their own accident insurance, health insurance and life insurance, and it is best to designate the beneficiary as a child. Can you grow up with him? It is best to buy 25 diseases of severe illness insurance. The major diseases are divided into 6 kinds of diseases and 7-25 kinds of diseases. The specific diseases are listed in the appendix, and 6 of them are critical disease insurance. Children's exclusive critical illness insurance is Shantou? Leukemia is a serious illness in children's high incidence (Baidu Encyclopedia data: the sixth place in children's malignant tumors), the responsibility of extra payment is indeed the conscience setting of the product developer, but for this separate additional payment responsibility, bear higher premiums If it is worth it, it is necessary to look at the psychology of consumers. Insured should not only consider the family economic factors, but also the protection points at different ages. In general, parents should first do the child's personal protection, and then selectively insured some financial insurance. According to CCTV, one child died of cancer every three minutes. In China, the incidence of childhood cancer has increased by 2.8% every year for nearly ten years, and the number of newly-increased malignant tumors has reached 30,000 to 40,000 per year. For the treatment effect, parents bring their children to Beijing, Shanghai, Guangzhou and other big cities for treatment, resulting in high medical expenses. Insurance products are more complicated than funds, stocks and bank wealth management products. However, no matter how complicated the products are, there are logical relationships. As long as we do shop around, we can naturally find out the advantages and highlights, defects and problem. If you have any insurance problems, you can contact us and we will answer you as soon as possible!